Welcome to the online portfolio of Robert and Kristin Smith where you will find examples of wildlife and nature subjects from our files. Robert and Kristin enjoy nature and outdoor activities. As a forest and wildlife biologist, Robert began taking photographs to document species and places where he was working. Quite soon a camera was always included in our outings. When Kristin, an ecologist, started shooting outdoor imagery as well, we began arranging trips specifically to take pictures as we evolved from a point and shoot mentality to a more thoughtful mode of photography to illustrate habitats, plants, animals, and some of the ways they act and interact. We find that we enjoy showing other people some of the outdoor world they may never get a chance to see, providing new perspectives, or helping them remember a special experience. If you are interested in using any photograph for commercial or personal use, please contact us by email. All images are copyrighted and use without permission is illegal. We hope you enjoy our imagery and thank you for visiting. Most folks who shoot with me know that I’m a big fan of MANUAL Photoshop – getting it right in the scene and in the camera BEFORE you press the shutter release. I am NOT a big fan of “I’ll just fix it in Photoshop”. Even when I might be able to fix it in photoshop, it’s often just too much work. It’s ever so much easier to get it right first. I recently led a photographic workshop at Indian Point RV Resort as a part of the City of Gautier, Mississippi’s 2nd Annual Plein Air Art Competition. 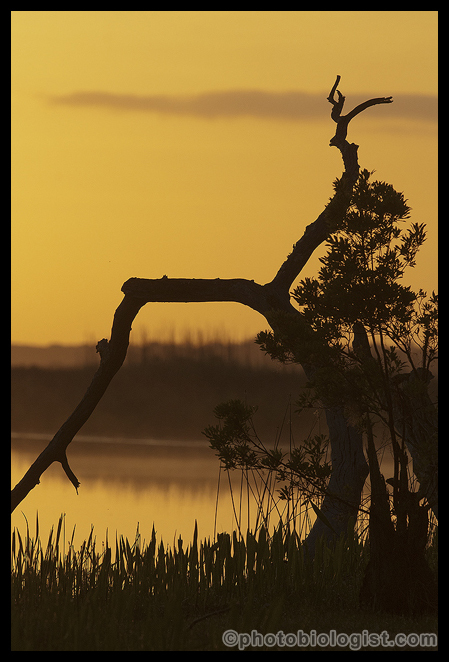 One thing that I offered was to meet participants to shoot the sunrise on Sioux Bayou. When I am leading photographic workshops, I am usually not shooting much myself – focusing instead on helping the participants learn and get their shots. 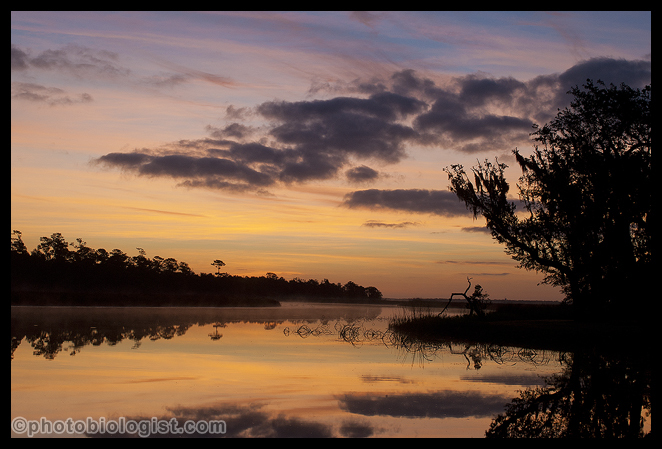 We had a small group for sunrise, so I went ahead and got out my camera and tripod, and I was glad that I did. I had told them that there was a snag that herons and egrets often perched on. And just as the sun started to break the horizon, sure enough a snowy egret lit on the side of the snag. Then it moved on up to the top, right where I had envisioned it. Now, I vastly prefer to shoot critters rather than landscapes, so when the egret perched up there, I didn’t even press the shutter release on my wide angle lens (my mistake). I went to the truck, and got out a long lens and another tripod so that I could get a cool egret silhouette shot. I got the gear back down where I wanted it, got it set up, focused on the egret. Then I rotated the lens from horizontal to vertical, and the bird flew away! In a fit of pique, I went ahead and pressed the shutter release to add to my growing collection of “perch” pictures. Now, a perch picture is a picture of the branch (rock, log, etc.) that a bird HAD been perched on moments before. Another shot for my perch collection! As I looked at the image as I got ready to download my shots, I realized that I could “fix it” in Photoshop! So, I selected the brush tool, and drew a snowy egret right where it was before. 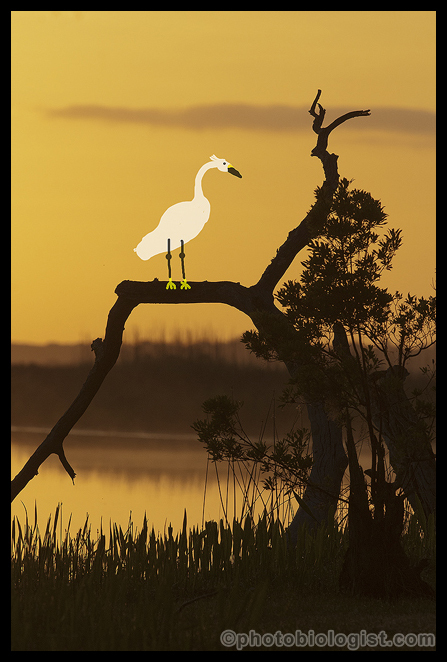 But instead of making it just a dark silhouette, I went ahead and made it a somewhat natural-color snowy egret. 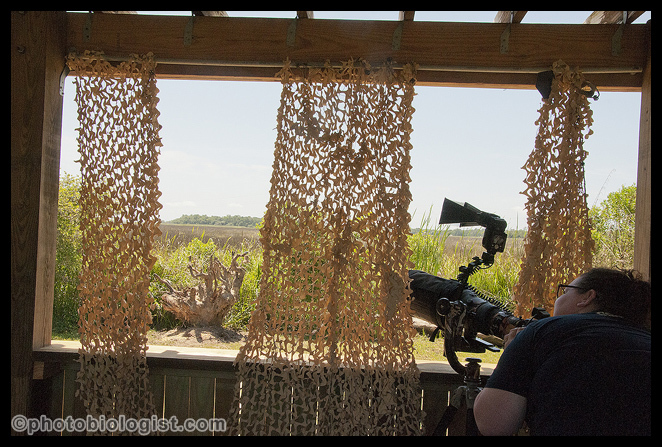 I did grab a few shots of some of the photographers shooting out of one of the two bird blinds, as well as a pair of photographers photographing an American alligator. 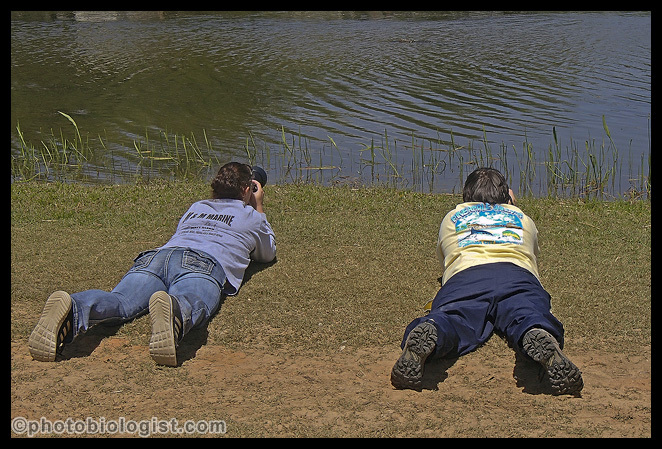 The alligator came up and posed within 10 feet, as did a sora, and a trio of black-bellied whistling ducks. All in all, we had 17 bird species, two mammals, and a few damselflies, dragonflies, and fiddler crabs within photographable distance during the workshop. 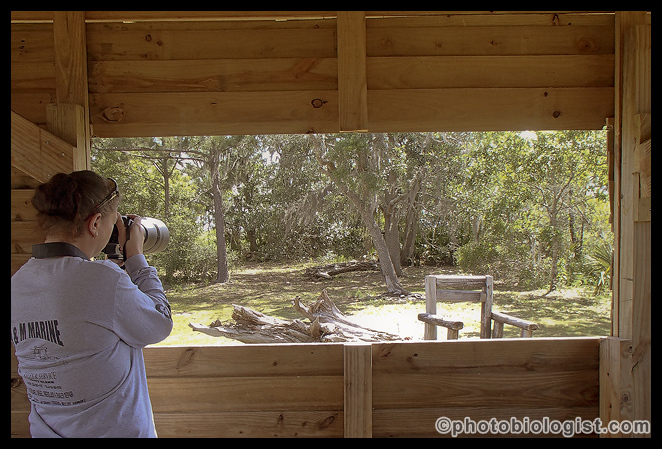 Shooting out of one of the bird blinds at Indian Point RV Resort in Gautier, MS.
Another view out of one of the bird blinds at Indian Point RV Resort in Gautier, MS.
Gotta get eye-level to get a cool gator shot! I did manage to get a couple of shots of the birds during the last part of the afternoon. 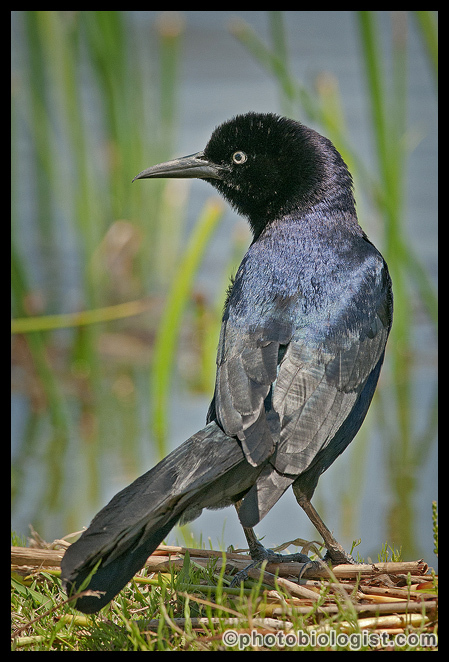 Boat-tailed grackles are ubiquitous – luckily the males are attractively iridescent too! 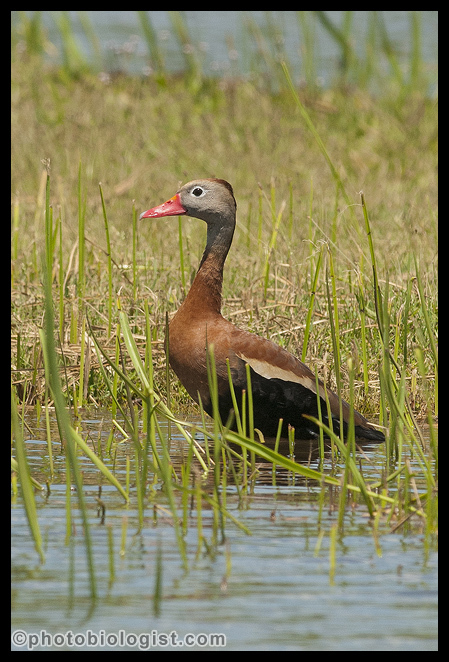 Black-bellied whistling ducks are increasing in number on the Mississippi Gulf Coast, but they are especially increasing around Indian Point right now. Photography is fun. And sharing pictures with others makes it even more fun. I’m using sharing in a VERY broad context. I’m including sharing with friends, sharing with editors, sharing with coworkers, and sharing a final product with a client. Historically, those images were shared as prints, and in many cases, that is still true. But other times, those images may need to be shared digitally. Social media has made it very, very easy to share lots of pictures with other people very quickly. Sharing one or two high resolution digital images via e-mail is reasonable. But what happens when it is time to share a lot of high resolution images? Some times when I share a folder of images or a selection of digital images with an editor or other user, I use a “cloud” service like DropBox. But there are times when you want to deliver a physical product, even if you are delivering digital images. Many years ago, I bought a printer that would print images on compact discs. I would save or “burn” the selected images to the CD, and then work up an image and label for the CD and print it on the CD. Sometimes, I’d deliver the CD in a special case that also held a 4”x6” or 5”x7” traditional print. 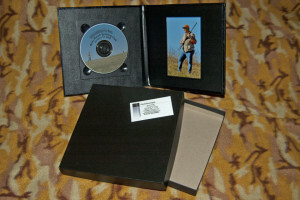 Client images from 2008 on a CD packaged with a traditional print. It’s been more than a few years since I’ve printed an image on CD, though that printer still works. My daughter’s current PC does not even have a CD drive. My current method of choice for sharing a number of images or large files is a USB drive. 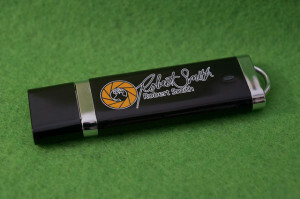 These little USB drives are also called USB fobs, flash drives, thumb drives, memory sticks, pen drives, and jump drives. It is much easier to put the images on the USB drive than it is to put them on a CD. They are lightweight, easy to transport, and seem to have a good digital lifetime. There are also USB ports on all manner of electronic devices including PCs, televisions, “digital picture frames”, and more. Not only can I save the digital images on a USB drive, I can also save a PDF version of the imaging license or useage release that tells what rights I am sharing with those images. I also usually put a “contact” file on the drive that has my business contact information on it should whoever end up with the drive in the future need biological or photographic expertise. In the past several months, I’ve had 3 occasions where a USB drive was either the logical or requested method of sharing. The first was after a land management workshop that I helped facilitate. The workshop information and Powerpoint presentations were all going to be compiled and sent to all the presenters and participants. Traditionally, this would have all be printed out and put into some sort of binder and mailed. In this case, it was significantly cheaper to convert all the files to PDFs with each “slide” having it’s own page and save them to a USB drive than it was to print the same files with 3 “slides” to a page and put them in a spiral or 3-ring binder. The USB drives were also cheaper to mail than the traditional paper booklets would have been. I was invited to be a featured artist at a small gallery recently. There is limited room to hang images in the gallery, so deciding which traditional prints to hang was not easy. There were several other images that I wish that I could have taken. The good news was that the gallery manager said, “We also have a high-density , flatscreen television mounted just outside the gallery room that you are showing in. Bring a dozen to a hundred of your other images on a USB drive, and we can run them as a loop on the television.” I took a USB driver over, and we plugged it into the USB port on the back of the television, and my images were there in a matter of seconds. I also do some outdoor event photography. Joe Venus (www.outlawphotography.com) and I recently shot a 2-day event. One of deliverables was a slideshow the last evening with action shots of all the participants. We provided that slideshow on a USB drive. After the event, the organizer asked was there any way that we could provide a copy for each of the participants. Of course there was! Thirty-seven additional USB drives later, each participant has his own version of the show. 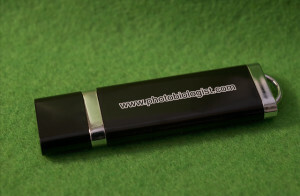 USB drives come in a variety of sizes from 64 megabytes to 16 gigabytes or larger. USB drives can also be customized. There are all sort of shapes and colors, and there are all sorts of innovative ways to protectively cover the end that plugs into the electronic device. 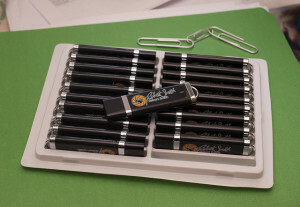 I recently acquired 25 personalized USB drives from USB Memory Direct. I am a pretty simple guy, so I chose a pretty simple option. I chose a traditional drive with a removable cap (style DE) that was black with silver accents with my logo/website printed in it’s normal orange, black, and white – though it was divided to print on both sides so that it could be a little larger than if it were put on both sides. Front side of custom USB drive from www.usbmemorydirect.com. Rear side of custom USB drive from www.usbmemorydirect.com. The folks at USB Memory Direct were easy to contact and responded more quickly to my messages than I did to their replies. The digital mock-up of my drives looked good, but they said when they started processing it for real the logo got a little distorted. I resent the image in a vector format, and everything went great. A few days later, I had a very padded parcel of USB drives sitting on my desk! The drives feel solid. The caps are snug. The logos are tough – I scratched on one with my thumbnail, and it looked just like it did before (though I’m sure that if I carry one around in my pocket with change and keys, that it will show signs of wear). A tray of USB drives waiting to be loaded and sent to clients! While I did not use any of the additional services that USB Memory Direct offers, they will format the drives in different ways, preload information on them (in hindsight, I should have gone ahead and had them load my business contact information on the drives), and more. Somehow giving clients a physical product with digital images feels like more of a transaction than delivering those same files through the ether. Based on some recent conversation, I am recycling an article I originally wrote for Carolina Nature Photographers’ Association Camera in the Wild. For those of you who know me, you can stop worrying. I have not suddenly morphed into some kind of technology guru who is keeping up with the latest and greatest must-have piece of equipment. I am talking about how to start a fire with your camera gear. Why might you need to start a fire with your camera gear? Maybe you slipped into a stream while photographing winter waterfalls. You might have gotten turned around, and need to spend the night out. You need a fire to attract attention from rescuers. You simply want a warm cup of coffee or need to cook the hot dogs. Whatever the reason, let’s imagine that you want or need a fire. Furthermore, let’s imagine that maybe you gave your emergency cigarette lighter that stays in your camera bag to a friend on your last group outing. And you haven’t checked that small wilderness survival kit in years, and the match heads have turned into soft putty. Well, you can use your camera equipment to start a fire! We will discuss using telephoto lenses, Fresnel flash extenders, and camera batteries to ignite fires in two different ways. More important than the ignition source when starting a fire though is having the right fuels available for the fire to continue burning. Laying a fire properly and using properly sized & arranged fuels is as critical a skill in successful fire starting as the ability to get ignition. Before lighting the fire, make sure you have enough fuel available for the fire burn for some time. The first fuel that is lit is called tinder. This is usually very thin, very dry material. Good examples of tinder include pocket lint, very dry grasses, shredded cedar or hibiscus bark, and very dry grass or aster seed heads. 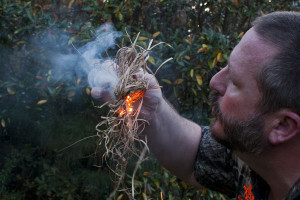 It is important to make a small nest or knot of this tinder so that once it is ignited you have a large enough and hot enough flame to ignite the kindling. And kindling is the next larger size of fuel. 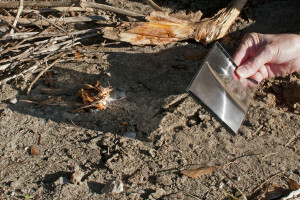 Kindling is usually placed on top of the tinder so that the rising heat and flames ignite the kindling. 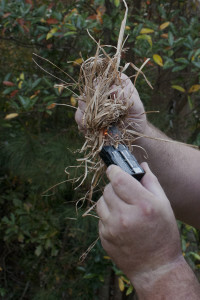 Dead, dried twigs that are smaller than a number 2 pencil make good kindling, especially greenbrier and yucca. Sappy heartpine from most of our southern yellow pines, including pitch pine in the mountains and longleaf pine in the flatwoods, makes an excellent kindling, especially when splintered. Once the kindling is burning well, larger and larger wood can be added to the growing fire to meet your needs. Make sure to leave plenty of space in the fuel piles for the fire to breathe, as oxygen is necessary for the fire to burn. It is a great skill to be able to start a fire with only one match (or without a match!) in damp situations. But in an emergency situation when you may have a limited number of attempts, the judicious & sparing use of small amount of accelerant may help get your fire going. An accelerant is a flammable substance that aids in the spread of an intentionally set fire. Some accelerants include gasoline, some bug sprays, some hairsprays, starting fluid, and powder out of a firearm cartridge. Basically, if the container says something like “CAUTION! KEEP AWAY FROM HEAT AND FLAMES”, it is likely an accelerant. Again, using an accelerant may be dangerous and should only be considered in an emergency situation. 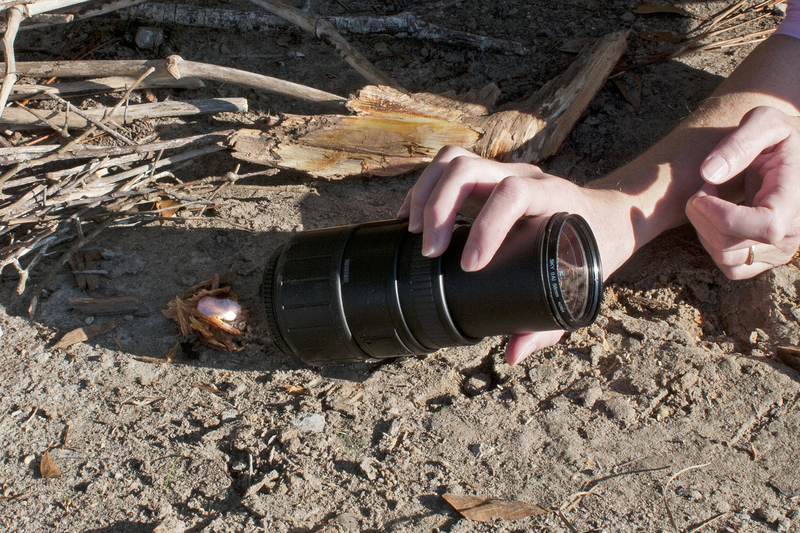 Our camera lenses generally magnify subjects, and longer lenses are basically fancy magnifying glasses. We all know how to take a magnifying glass and focus the sun in a bright spot that will quickly cause paper to smoke. We can use that same concept to start a fire. In theory, the longer and faster telephoto lenses focus more light and create a more intense heating effect. In practice, “big glass” is difficult to align and hold in the same position. Shorter lenses, such as an 80-200 mm f/2.8 lens or a 70-300 mm f/5.6 lens work just fine. There are several steps in using your camera lens to start a fire. Take the lens off the camera. Remove the front & rear lens caps (if in place). Remove the lens hood. If it is a zoom lens, extend the zoom to the maximum length. Open the aperture as wide as it will go, whether that is f/2.8 or f/5.6 (and the wider apertures focus more energy). Note that on some newer lenses, this may mean finding & holding the diaphragm pin open with your finger. Align the lens with the sun holding the end that attaches to your camera closest to the tinder you want to ignite. The distance from lens to tinder will generally be around 2 inches to get the most intense heating (the smallest spot of the brightest light produces the most heat). Simply move the lens closer and further from the tinder until you find the right spot. Note that upon ignition, you will want to quickly get your lens away from the heat and smoke. A Sigma 70-300 mm lens (at 300 mm and f/5.6) is used to ignite a fire. Holding a Fresnel flash extender about 8 to 10 inches from the tinder you want to light can result in rapid ignition. It is a much simpler lens to use than a camera lens, but not all nature photographers use Fresnel flash extenders. The lens from a Better Beamer Flash X-Tender is used to ignite a fire. Magnifying glasses work great to start a fire when there is bright light, but what if it is cloudy or dark? Your camera battery (or cell phone battery or car battery or other battery combination with reasonably high voltage) will work just fine as an energy source to ignite steel wool. The drawback to this technique is that you will need steel wool. The finer the steel wool, the better this technique works. 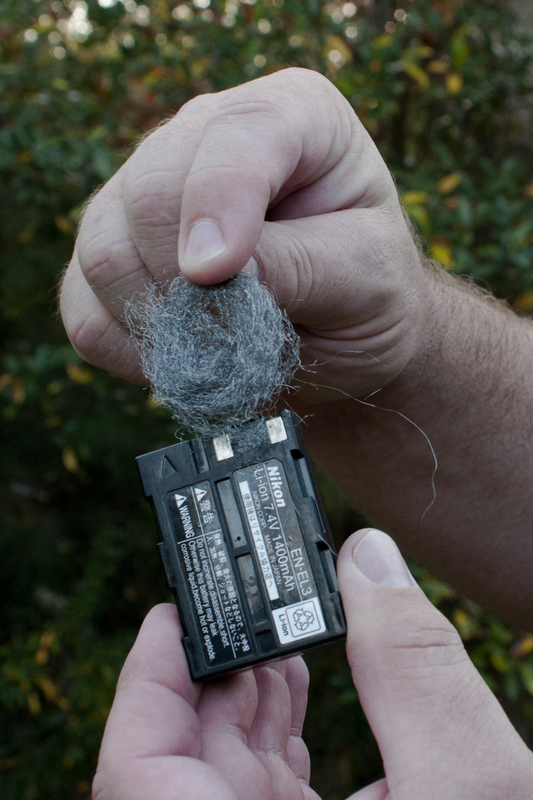 Basically, you touch the steel wool to the positive and negative battery terminals at the same time. A large current flowing through a tiny wire results in lots of resistance. This resistance creates enough heat that to quickly ignite the wire. This burning steel wool may already be placed in a nest of tinder or quickly transferred to tinder to ignite the fire. When steel wool touches the positive and negative terminals of a battery (in this case a Nikon EN-EL3), it rapidly ignites. 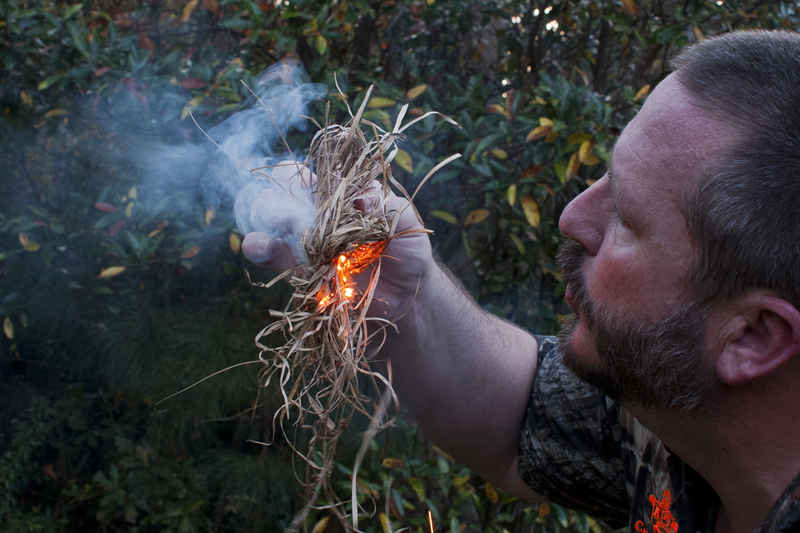 Fire is the quick result of applying a battery to steel wool surrounded by a knot of tinder. This shot was taken 7 seconds after the other shot. 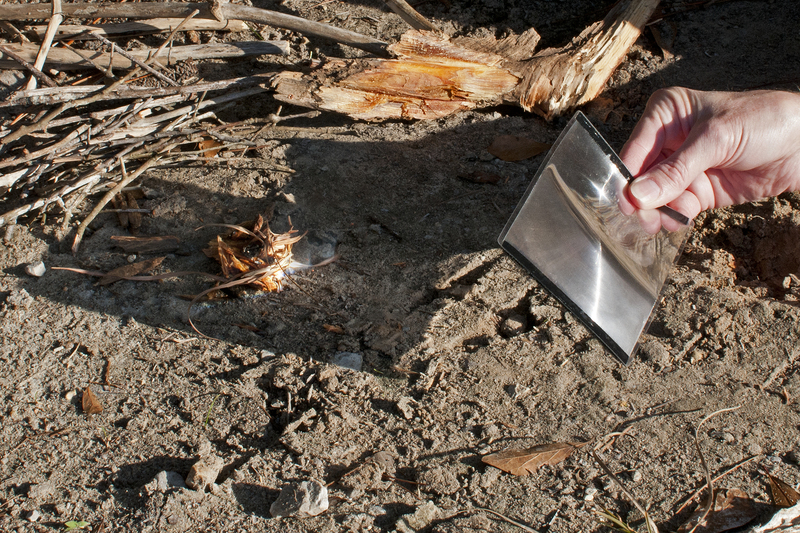 Take the time to put an emergency cigarette lighter and a small wilderness survival kit in your bag and hopefully you will never need to use these techniques. Robert will be glad to demonstrate these techniques if you catch him in the field. In addition to starting fires with these, he has also started fires with flint & steel, a fire bow, a fire piston, chemical reactions, and a firearm. 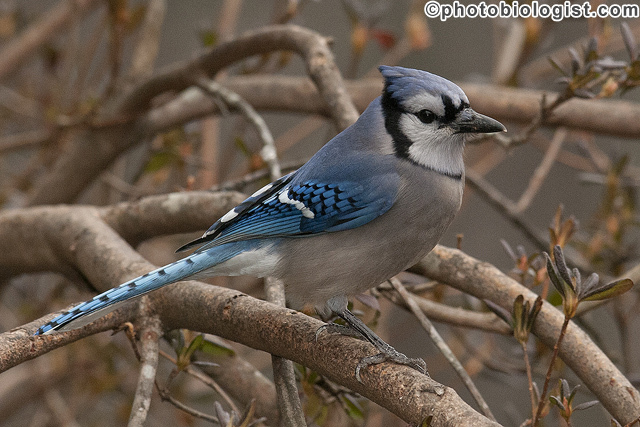 After a 3-year hiatus, I managed to go back to Gary Carter’s in McLeansville, NC earlier this February to photograph wintering birds of the eastern deciduous forest and yard. 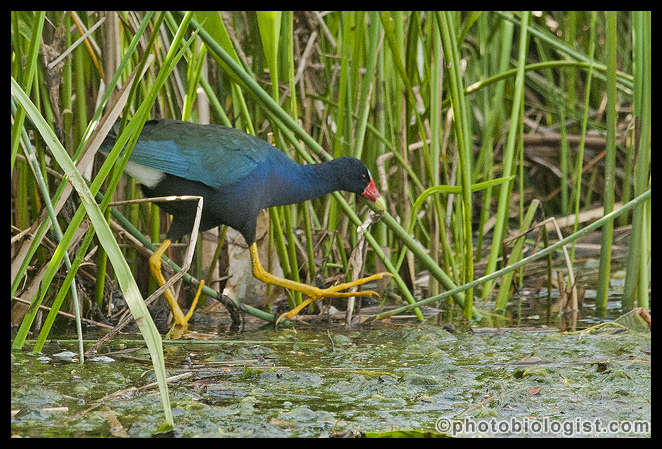 As you can quickly find out from a web search and reading the articles about and watching the television shows filmed from Gary’s blind, it is a fantastic location to photograph birds. 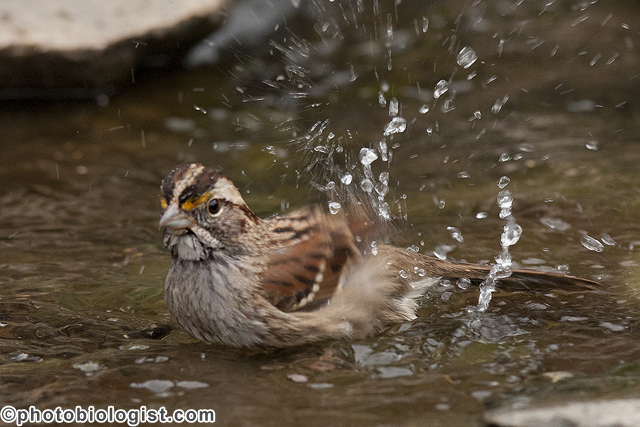 Gary hosts bird photography opportunities (http://garycarterphotos.com/main.php) ¬mainly in the spring where you have a chance to catch birds in their breeding splendor and also pick up some of the migrant warblers as they pass through. 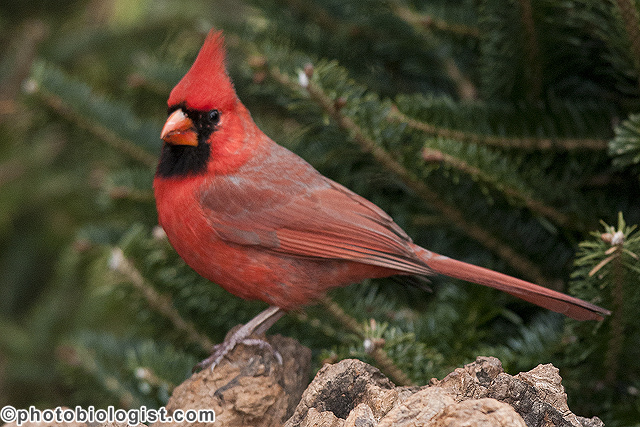 In the winter, there are chances for resident and wintering birds. So a visit in February and a visit in April will result in almost totally different birds! 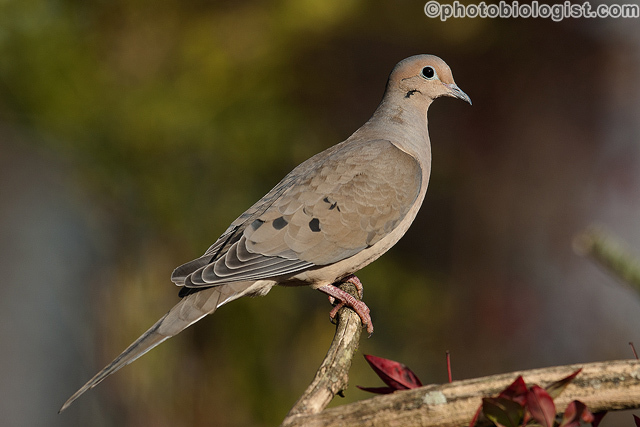 Mourning dove on a snag. Gary’s blind comfortably holds 6 photographers, and we had a great group of photographers to shoot with on this trip: Mark Hoyle (http://www.markhoylephotography.com/), Elizabeth Gray (http://photographybyelizabethgray.com/), Ceasar Sharper (http://cdsharper.zenfolio.com/), Larry Basden (https://www.flickr.com/photos/30717042@N04/), and myself. Gary kept a steady supply of foods available to both the birds and photographers. 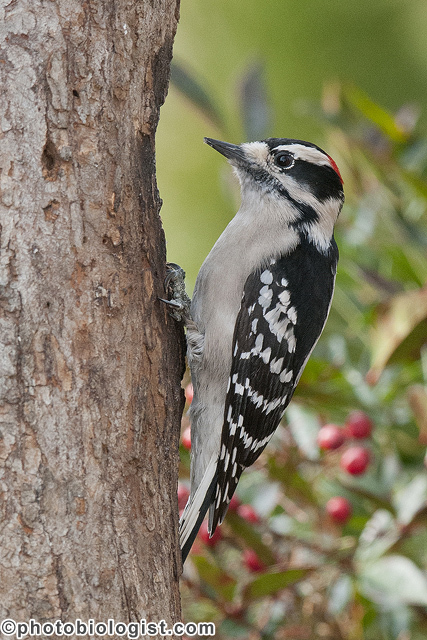 Male downy woodpecker on a snag. For this winter visit, I really wanted another chance to photograph a male yellow-bellied sapsucker (which I did) and hoped that a brown creeper would cooperate (he had been there a couple of weeks before, but did not show up for us). A week or so before we arrived, the area got hit with some snow. A week or so after we left, the area got hit with another snow. While we were, there the weather was cool, but pleasant with mostly cloudy conditions – great weather to sit in a blind and photograph birds, even if we couldn’t photograph birds in the snow. Yellow-bellied sapsucker on a dead pine. The birds were out in force! We sat in the blind for a day and a half and had 29 species of birds flit into shooting range. Some of the birds were real hams, like the dark-eyed juncos and chipping sparrows. 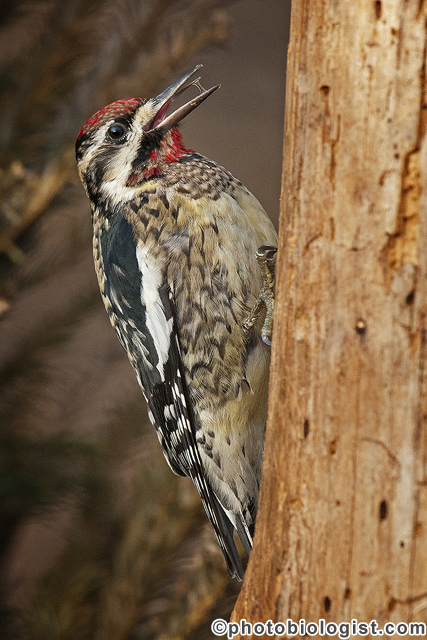 Others were more reticent, like the red-bellied woodpeckers and fox sparrows. The blue jays were surprisingly cooperative this trip. We had other birds, including a couple of hawk species, turkey vultures and many tantalizing overpasses of flocks of cedar waxwings that flew within sight of the blind, but were not photographable. Blue jay in an azalea bush. 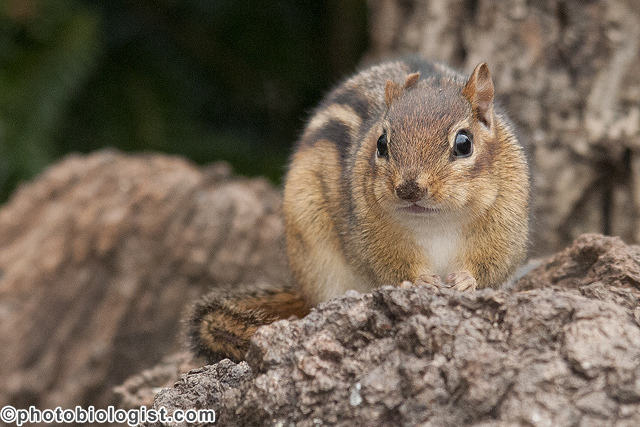 We also had gray squirrels and chipmunks come and pose for us from time to time. 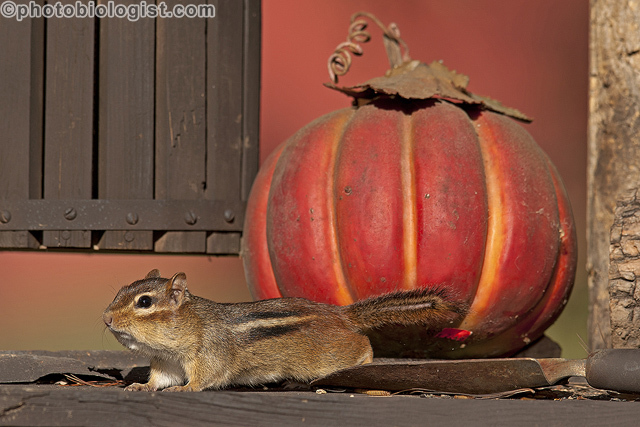 Chipmunk posing on a log. 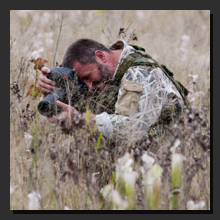 The sheer diversity of shots that a bird photographer can take at Gary’s without leaving a small blind is amazing. You can capture shots that look almost like a meadow. 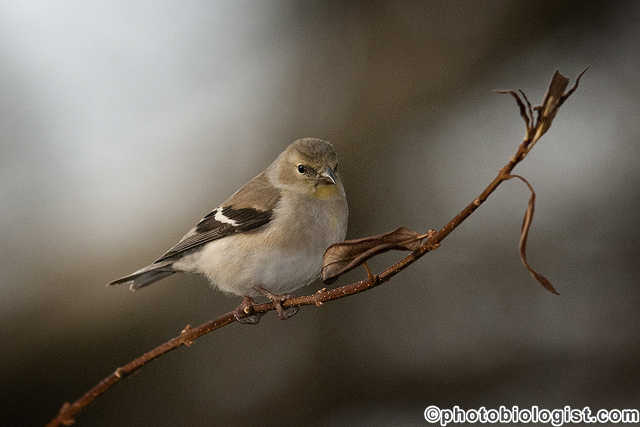 American goldfinch perching on a goldenrod. You can capture shots that look like a forest. 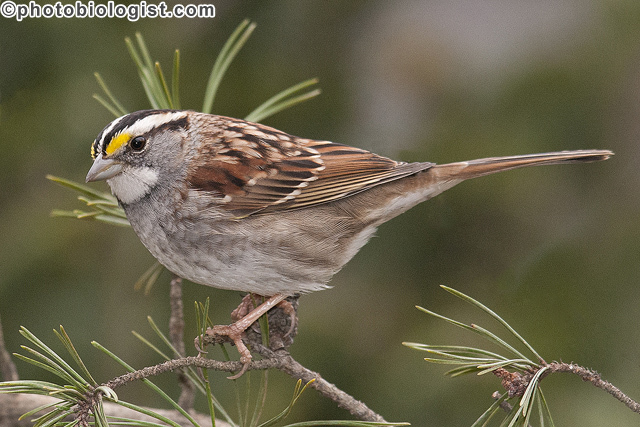 White-throated sparrow in a Virginia pine. 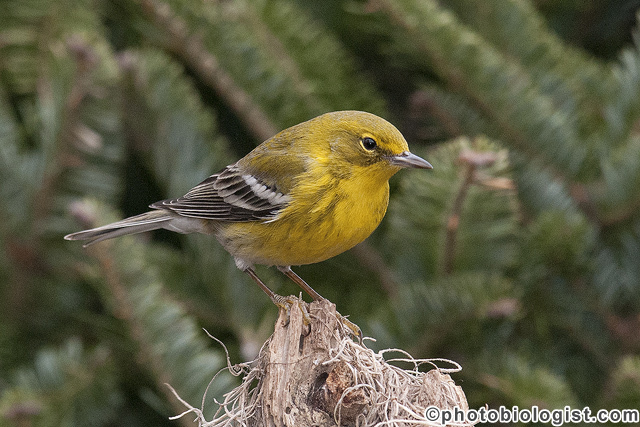 Pine warbler on a snag. You can capture the “Birds & Blooms”-type shots. You can capture drinking & bathing shots. And the scenery will change a little throughout a single visit as Gary’s exterior decorating skills are put into play to change small details to create yet another kind of image that can be created. I cannot wait for another chance to visit Gary’s bird blind and spend some quality time learning from and sharing with other photographers. 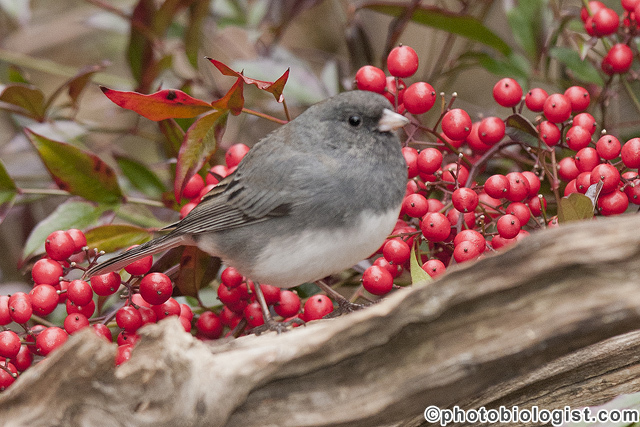 Dark-eyed junco on a perch. 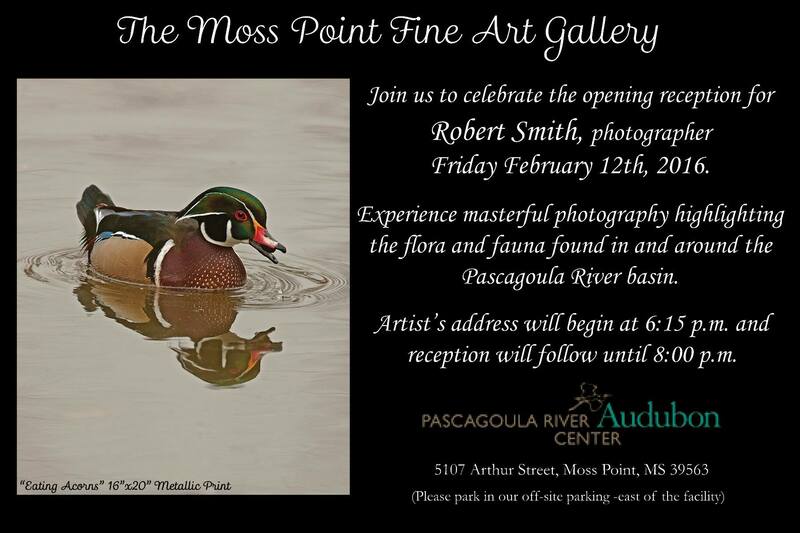 I am delighted to share that a selection of my favorite images of flora and fauna found in south Mississippi will be on display at the Moss Point Fine Art Gallery in the new Pascagoula River Audubon Center in Moss Point, MS from mid-February until mid-May. I will be available in the gallery several times while this show is hanging and will likely offer some short photographic presentations and workshops during this show. There will be an artist’s address and reception on February 12, 2016 that is open to the public. 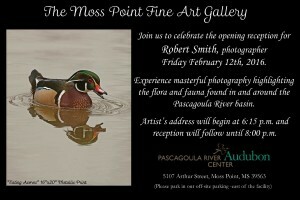 Use the Contact link to get in touch with me for more information or contact the Pascagoula River Audubon Center (http://pascagoulariver.audubon.org/). All of the framed photographs in this show were masterfully framed and matted by Randy Landers of Landers Fine Art and Framing (https://www.facebook.com/Landers-Fine-Art-and-Framing-335579478568/).